I was recently approached by a lovely friend of mine whom i shall call Ms. Ice Cream about this new 'magnetic wave design' nail polish. She really wanted to try it but was afraid she'd mess it up so she suggested i try it and blog about it. I wasn't sure i knew what this was but my curiosity got the best of me. I didn't realize it at the time but during my last trip to Sephora, i noticed a nail polish by "Nails Inc." a brand i absolutely adore by the way, and they actually have a magnetic wave nail polish line as well. I remember picking up the wand and feeling a bit overwhelmed by it so i quickly put it down and walked away. My friend was particularly curious about the Deborah Lippmann set that actually comes in two color schemes. I opted for the purple hues which consist of a light shade called Berry Metal and a richer pinkish purple called Love is a Battlefield (which makes me want to break out into song lol). I purchased this set from HSN for $25 (it's actually $30 but i searched for an online coupon code and got $5 off SCORE!) I promptly played around with the wand and mixed up the layers to determine which i liked best. So here it is! Step one: Apply a clear base coat. You can use any that you already have. Step Two: Apply one coat of Love is a Battlefield. Let it dry completely. 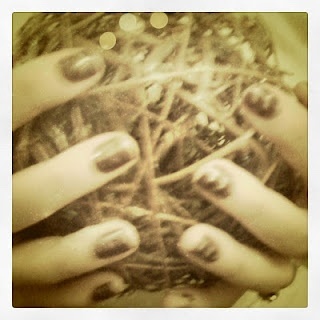 Step Three: Apply a coat of Berry Metal one nail at a time. 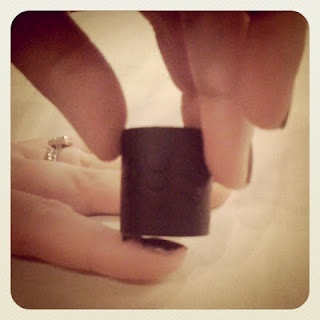 As soon as you apply it to one nail, quickly apply the magnet wand over the nail. There is a little arch on the wand that you can place on the cuticle of the nail, being careful not to touch the nail with the wand. Hold for 10 seconds and voila! Overall, it's not very hard to do though it is a bit time consuming. I like it, it's very different from anything i've ever tried and if nothing more, it's pretty darn cool. I'm not exactly used to wearing these kinds of effects on my nails so it's taking a little getting used to. The next time i go to Sephora, i will check if Nail Inc has a greater variety of colors. If i find anything that fancies me, i will pick it up and post a picture!